Refreshing your mind for a sec, won't you? The quiz was taken from eMedicine case presentation. A 30-year-old man presents to the emergency department (ED) with fever, yellow eyes, and abdominal pain. The patient developed the fever, as well as chills and myalgia, approximately 5 days before presentation. He treated himself with antibiotics that he "had laying around the house," but there was no improvement in his condition. His fever remained high (up to 104°F [40°C]), and he later developed upper abdominal pain and decreased urine output. He denies having any diarrhea, vomiting, or respiratory symptoms. He reports no blood in his stool or urine. He has no significant medical or surgical history. He has no known allergies and is not currently taking medication. For the past year, the patient has been travelling between the United States and Equatorial Guinea. In fact, the patient recently returned from a 2-month trip to Equatorial Guinea last week. He denies smoking tobacco, consuming alcohol, or using illicit drugs. On physical examination, he is ill-appearing but in no acute distress. His oral temperature is 103.6°F (39.8°C). His pulse is regular at a rate of 90 bpm, and he is mildly hypotensive, with a blood pressure of 85/45 mm Hg. His respiratory rate is rapid but unlabored at 28 breaths/min. Icteric sclerae are noted. His breath sounds are clear to auscultation. His S1 and S2 heart sounds are normal and there are no detectable murmurs. His abdomen is soft and normal active bowel sounds are heard. The liver is enlarged approximately 4 cm below the right costal margin and mildly tender. His spleen is not palpable. He is noted to have scattered petechiae on all extremities. A complete blood cell count (CBC) shows a hemoglobin of 11 g/dL (110 g/L); a white blood cell (WBC) count of 5.9 × 103/μL (5.9 × 109/L), with 90% neutrophils, 2% lymphocytes, and 7% bands; and a platelet count of 9.0 × 103/μL (9.0 × 109/L). His blood chemistry reveals a blood urea nitrogen (BUN) of 43 mg/dL (15.35 mmol/L), a creatinine of 2.3 mg/dL (203.32 µmol/L), a total bilirubin of 8.2 mg/dL (140.22 µmol/L), an indirect bilirubin of 3.7 mg/dL (63.27 µmol/L), a direct bilirubin of 4.5 mg/dL (76.95 µmol/L), an alkaline phosphatase of 219 Units/L, an alanine aminotransferase (ALT) of 219 Units/L, and an aspartate aminotransferase (AST) of 225 Units/L. The hepatitis A IgG examination is positive, with a negative IgM. Both hepatitis B and C serologies are negative. Blood cultures are negative. A chest radiograph shows no abnormalities. Abdominal ultrasonography shows sludge in the gall bladder, with a fatty liver, but no space-occupying lesions, gallbladder wall thickening, or pericholecystic fluid are seen. A Giemsa-stained blood smear is obtained at the time of admission (see Figure 1, the blood smear is shown at 500× magnification). Hint: The patient's travel history and blood smear are critical to the diagnosis. AND What is the Correct answer? The differential diagnosis of acute febrile illness and hepatitis in a returning traveler must at least include the following tropical infections: malaria, dengue fever, hepatitis A, mononucleosis, rickettsial infection, and salmonellosis. A moderately elevated ALT (3-10 times the upper limit) can be observed in these tropical diseases, and unconjugated hyperbilirubinemia might be seen more often in malaria[2,3]; however, these findings are not specific. Specific diagnostic tests are therefore necessary to confirm or exclude each infection when suspected. This patient's Giemsa-stained blood smears revealed numerous ring-shaped trophozoites in normal-sized red blood cells (RBCs) consistent with Plasmodium falciparum. Parasitemia was detected in 12% of the RBCs. 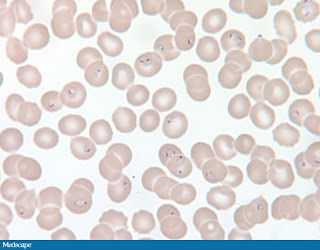 This confirmed the diagnosis of malaria, an infection of the RBCs by the parasitic Plasmodium species, which is acquired from the bite of an infected female Anopheles mosquito. Malaria is the most important cause of acute febrile illness in travelers returning from endemic areas. Between 1996 and 2006, there were approximately 1,400 cases of malaria per year reported in the US. Almost all reported cases in 2006 were diagnosed in travelers returning from Africa (West Africa), Asia (India), Central America and the Caribbean (the Bahamas, Belize, Costa Rica), South America (Bolivia, Brazil, Ecuador), or Mexico. The four Plasmodium species that cause most human infections are P. falciparum, P. vivax, P. ovale, and P. malariae. In reports from the Centers for Disease Control and Prevention (CDC) between 2004 and 2006, P. falciparum and P. vivax were identified in 60% and 30% of reported cases, respectively. The geographic distribution of each species is different. P. falciparum is more likely to be identified in infected travelers returning from Africa, whereas P. vivax is more likely to be identified in travelers returning from Asia, Central America, the Caribbean, or South America. Species identification is important because P. falciparum can rapidly progress and cause severe disease. The CDC reported 217 malaria-related deaths in the United States between 1963 and 2006; more than 90% of reported deaths were from P. falciparum infection. The incubation period is greater than 1 week, and 80% of patients with malaria report symptoms within 30 days of returning from an endemic region. Ninety percent of patients with P. falciparum reported symptoms within 30 days of returning from an endemic region, whereas only 54% of cases with P. vivax did so. The symptoms of uncomplicated malaria are nonspecific and include fever, headache, back pain, malaise, chills, rigors, sweating, myalgia, nausea, vomiting, diarrhea, and cough. Patients with severe malaria present with a number of clinical or laboratory manifestations, including prostration, impaired consciousness or seizures (in cases of cerebral malaria), respiratory distress, circulatory shock, pulmonary edema, abnormal bleeding, jaundice, hemoglobinuria (hence the name "Blackwater fever"), severe anemia, hypoglycemia, acidosis, renal impairment, hyperlactatemia, disseminated intravascular coagulation, and parasitemia higher than 5%. Microscopic analysis of blood smears is the most definitive test for confirming the diagnosis of malaria. [4-7] Both thick and thin blood smears must be performed in travelers with acute febrile illness returning from endemic areas. The test should be repeated at 12-hour intervals for 48-72 hours if the diagnosis is not established by the first smear examination. Blood smears can also help in identifying the infecting species; however, accurate identification of the particular species is greatly reliant on the pathologist's level of experience. Parasitemia, or parasite density (which is a percentage of infected erythrocytes), is obtained by counting infected RBCs on a thin film. The parasite density is essential to diagnose severe malaria and to monitor treatment outcome. Rapid diagnostic tests (RDTs) are an alternative to the blood smear. These tests are particularly useful in patients who were treated abroad without a parasitic diagnosis. [6,7] Several US Food and Drug Administration (FDA)–approved commercial kits are available for the detection of malarial antigens and for differentiating P. falciparum from the other 3 species. Rapid diagnostic tests, however, can be inaccurate in cases with a low number of parasites and cannot quantify the parasite density, which is one of the prognostic indicators. Clinicians not only need to identify the infecting species, but they should also know the regions that are endemic for drug-resistant malaria. P. falciparum from endemic areas is resistant to chloroquine, except for that found in the regions of Central America west of the Panama Canal, Mexico, Hispaniola, parts of China, and the Middle East. Except for particular areas of Papua New Guinea and Indonesia, P. vivax and P. ovale remain sensitive to chloroquine. Quinine plus tetracycline, doxycycline, or clindamycin is required for the oral treatment of malaria acquired in these endemic areas. This combination therapy is necessary to improve the treatment outcome and to prevent the development of resistance to each component of the combination. If the species cannot be identified, the clinician should initiate treatment for P. falciparum until proven otherwise. Deaths from malaria in the United States share certain characteristics. These patients usually have at least 1 criteria of severe malaria (often, cerebral malaria), and they usually expire within 4 days of admission. Factors contributing to malaria-related death are failure to take or adhere to chemoprophylaxis, inappropriate chemoprophylaxis, delay in seeking medical care for post-travel illness, failure to promptly diagnose and treat malaria, and inappropriate treatment for severe malaria. Chemoprophylaxis, prompt diagnosis, and early appropriate treatment are the keys to decreasing the high mortality seen in cases of severe malaria. In this case, the patient was quickly diagnosed on admission because of his travel history to an endemic area, clinical presentation consistent with severe malaria, and laboratory finding of intraerythrocytic trophozoites. Because quinidine was not immediately available, oral quinine and doxycycline were started after communication with the CDC. He did not require mechanical ventilation or hemodialysis. His parasitemia decreased to 3% after 3 days of oral antimalarial treatment, and his clinical condition gradually improved. Both his platelet count and renal function returned to normal. The patient had a complete recovery after 7 days of treatment with quinine and doxycycline. You are evaluating a patient who recently returned from Kenya and is experiencing high fevers, myalgia, and jaundice, which raises the concern for malaria. What is the most definitive test for establishing the diagnosis of malaria? The above mentioned patient is confirmed to be infected with P. falciparum. What is the first-line treatment of severe P. falciparum malaria in the US?